We are proud to offer a premium version of a desktop or nightstand valet to hold your valuables by your side. These are NOT made by machine or cheap plywood; they are made by 100% natural wood by our two hands. Our valets are sourced, assembled, stained, and finished by our two hands. Our Valets are made from premium woods such as solid oak, walnut, zebra wood, cherry, or purple heart, and other quality woods. 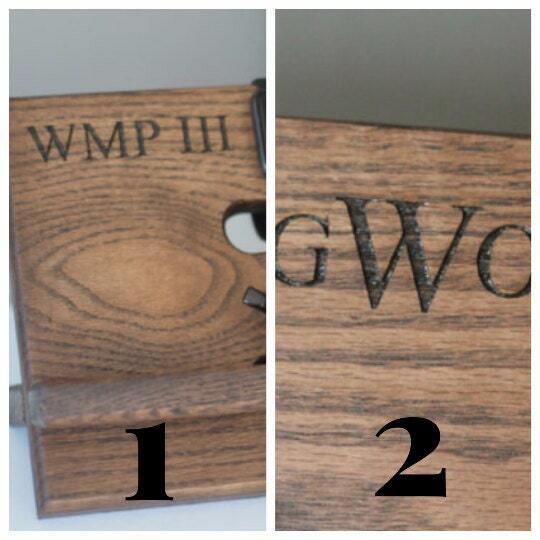 We can also provide locally reclaimed wood for special requests and depending on the species of wood chosen. For more on our process and materials, see the About Us page. This docking stand will hold your phones- (pictured iPhone 5s) the bottom piece is built to allow a charging cable to come up underneath to be plugged into the bottom of your phone. 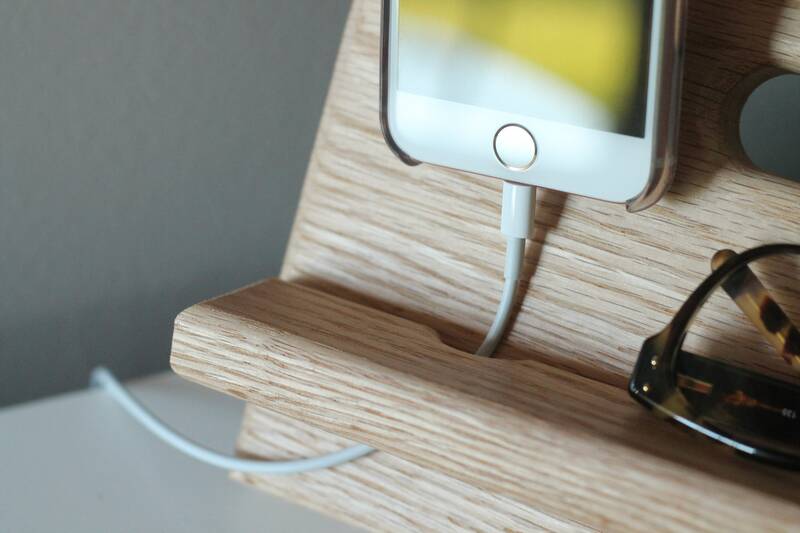 This will accommodate any phone that charges from the bottom, and this valet is designed to accommodate all phones- if your phone doesn’t charge from the bottom, you can still charge it from the side, or from the bottom and lay your phone on its side. An iPhone 6+ and the Droid equivalent will fit on here, but will stick up above the wood slightly. This phone stand also has a place to hold watches- depending on the size, 2-4 watches and exercise/fitness trackers. We also offer a valet without a section for watches, so you are able to keep a tablet and a phone on it. This charging station also has a place under the section for watches to include a shelf for jewelry, glasses, chapstick, or whatever you want! See our custom listing for a section for rings. This valet is made with solid Cherry. We would never use cheap plywood in our construction. Premium woods such as this only require premium polyurethane to bring out the beauty in the wood, no stain required. Option of initials added for additional charge. Included is up to 3 initials, anything more will require an upcharge. Initials are burnt in by laser, so the sky is the limit to what we can engrave. Everyone has questions. Send them our way, and we will be happy to explain anything to you. We deal with wood products every day of the year. We never expect you to know everything when you are looking at our shop. If you are ordering and you do not know what picture is Ebony vs Kona, ask us! If something does not make sense in our listing, let us know! 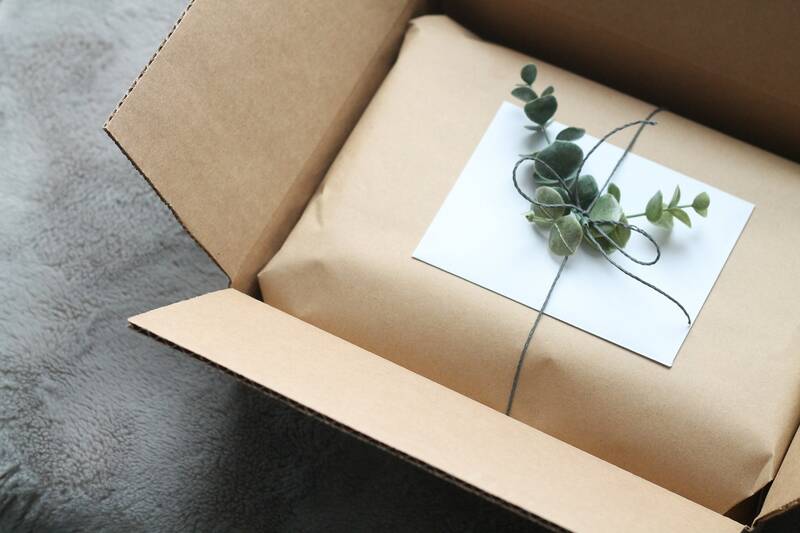 We have the same goal as you, we want you to order the product that you will love. Let us know how we can make it easier on you! There are no dumb questions. Ask away! I purchased this for my husband for Fathers Day. It is beautifully made and I appreciated the ability to engrave his initials. 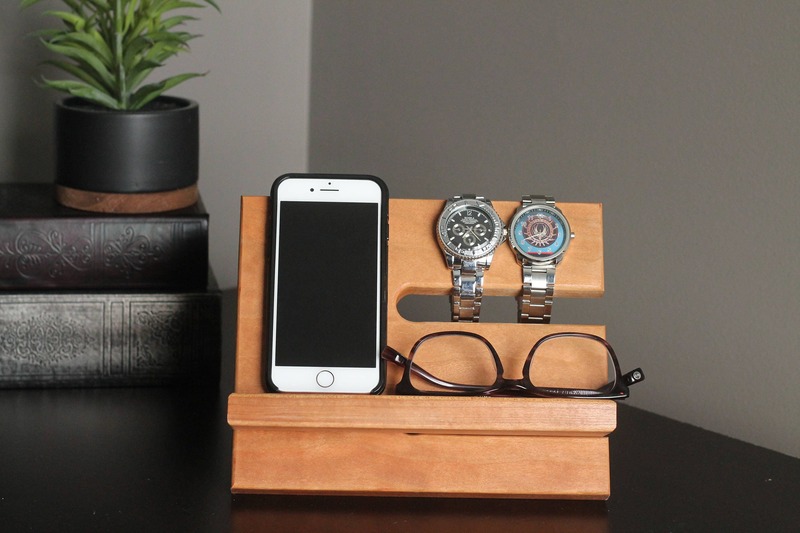 He has set it on his nightstand and it is a beautifully hand crafted stand. Thank you!! Gave it to my husband as a gift in an attempt to keep all his things in one place. So far it seems to be working. Beautiful simple design goes with our home. Thank you!